Its exceptional quality makes it the first choice for many while considering tiling, but much more than the installation of things in any building structure, their maintenance is important and key to the continuous appreciation of such. Do you use a ceramic tile floor and you really want to maintain it? Then we believe you might be in the lookout for the best tool or system to pull that off. We are also certain that your hobby isn’t definitely cleaning the house, kneeling and scrubbing. There are definitely more fun and passionate things for you to pick from. Yet, a neat environ is key to living a healthy life and you should do all to keep your home and surroundings clean and free from germs. One way that can be done is to ensure the floor of the house is well taken care off. As regards the above, we have helped put together a list of 5 top mop for use on the ceramic tile floors. 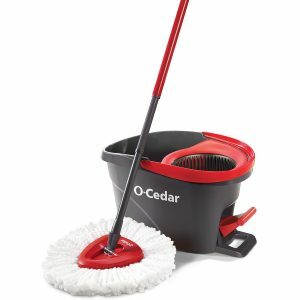 O-Cedar easy wring spin mop is designed after the good old-fashioned way of cleaning with the mop and bucket combos but with a new level of class. It’s one of the cleaning tools approved by America’s number 1 cleaning expert, Don Aslett. The design is standard with an exclusively built in wringer in the bucket which makes wringing out the mop head extremely easy and hands free, which is activated by a high-quality foot pedal on the outer part of the bucket allowing the level of moisture to be controlled. The bucket is also laid out such that a splash guard keeps the splash and sprays of liquid in the bucket when the wringing is been done. The mop is also fashioned such that it cleans a wide variety of messes, it has a durable wand that connects to a cleaning head which houses the cleaning pad. The cleaning head is a triangle form which helps take out the unnecessary stress of cleaning a corner as it would easily go all the way to any edge. The pad is made up of many microfiber strands which is safe and effective on any hard floor surface removing and absorbing tough dirt and grimes. An added feature of the mob stick is that its adjustable to suit different heights while the connector to the head of the mop can rotate by 360 degree so that it can maneuver and fit under furniture and corners. The O-Cedar Easy Wring Spin Mop is so simply to assemble, lightweight and comfortable to use. The entire system is compact enough to enter a kitchen sink for water fill, the microfiber also dries faster than the rope or cloth style mops. It does have a clear con in that, there’s no separate container space for dirty water. Cleaning the house is never a fun activity and as such whatever means by which it can be done in a faster, more efficient and effective way, it will be happily welcome and appreciated. This is what the Mopnado system brings to the table. Made from the highest quality material and with its unique features, it definitely comes to the fore of considerations when going out to get a floor cleaning tool. Perfect for cleaning all kinds of floor including laminate hardwood, all kinds of tiles, vinyl, stone and concrete. The mop head can rotate 180 degrees addressing the need to clean under the furniture or tight corners. The microfiber mop heads are durable and machine washable, providing money saving value over the traditional mops. The adjustable mop handle also makes it an option for cleaning ceiling fans and windows. The mop plates are patented and this feature makes it easy and stress free to rinse the mop head, all you’ve got to do is spin the mob effortlessly and the job is done. The Mopnado deluxe model bucket comes with 2 large wheels and 2 back and front handles that helps ease its mobility from one point to another while cleaning is going on. Each Mopnado set includes two mop heads, a scrub brush, a handle that’s adjustable from 47” to 56” long, a mop plate, one soap dispenser and one mop bucket. 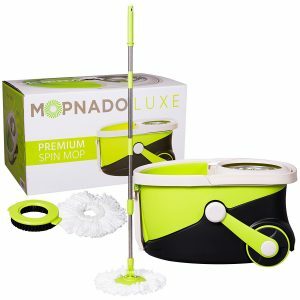 The products remain the only spin mop with a stainless-steel spin dry basket that wouldn’t rust, stain or retain any odor with use and with a year warranty from date of purchase, the Mopnado stainless steel deluxe rolling spin mop is the exact package for the right price. The newly designed magic mop from Aootek, which is indeed an upgrade of the previous products in every way possible with its nicer, more efficient and better effective features that makes the system a much less messy compared to many other mop and bucket systems. Simple to assemble, easy to clean and made from durable materials; this sentence summarizes the amazing qualities of this cleaning set. The mop is perfect for door, kitchen, bathroom, lobby, car, bedroom, etc. The mop heads have super thin microfibers with great absorbent ability which sufficiently removes fouling and fully cleaning without damaging floors. The handle which is made of flexible stainless-steel which does not rust may be adjusted from angle 45 to 180 degrees to suit the users comfortable mopping position. 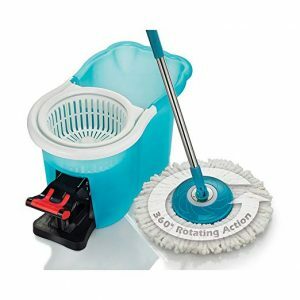 The spin mop bucket is dual-spout with no foot pedal, no plastic spinning axis or any moving part, either wheels or agitators that could break off, cause leaks and render the system useless, rather the bucket is sturdy yet very light and having a draining plug in the middle close to the foot making it easier to fill, dump or drain water efficiently. This labor-saving mop can help you cut the cleaning time and save your energy and water, keeping your hands-off dirty water. The super microfiber mop head wring twice drier than most of the other products in the market, cleaning better than cotton, drying floors instantly and that, without leaving a spill, shock or streak. It can also be used as a dry mop to pick up hair and dust. 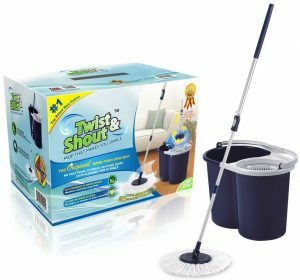 Twist and shout produced this one in a kind classic mop set which won the award for the original patented hand push spin mop. Its innovative design and structure once won the gold medal at the iENA international innovation award and the INST international invention show. 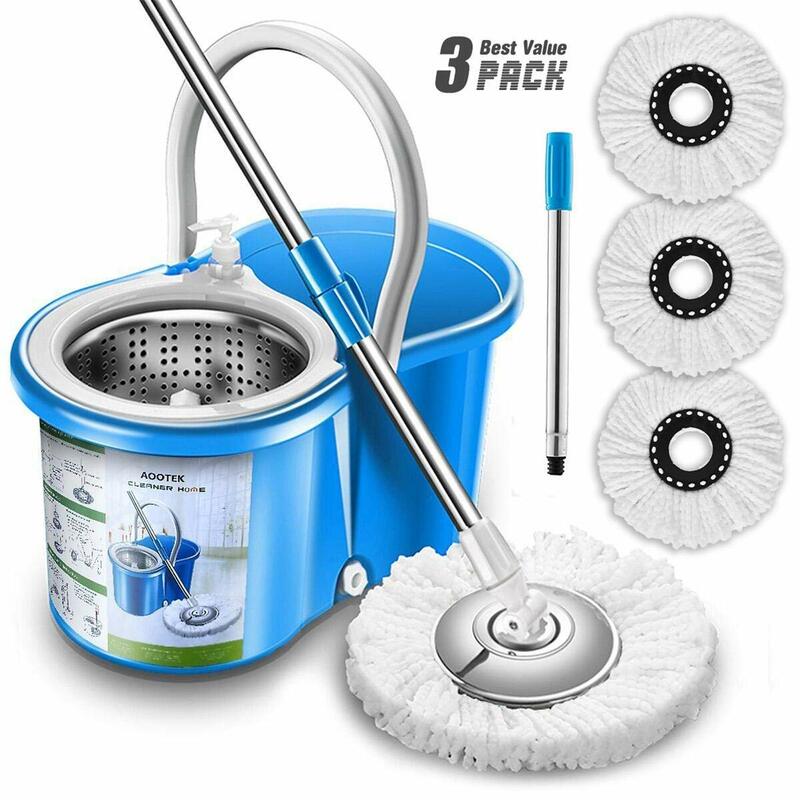 Whoever has tried the traditional mop or one of those ineffective and/ or overpriced cleaning tools and then uses this highly rated collection will without doubt understand the large gap in the efficiency of the compared tools in line with their cleaning and wringing abilities and the ease by which the later helps in doing the job. Few mops can reach the dusty areas under the furniture and the tight corners, but with the twist and shout mop, there’s no place for dirt. Rotating at 2500 rpm, while the mop head goes 360 degrees and also pivoting 180 degree coupled with the fact that the telescoping handle is adjustable from 44” to 55”, everywhere in the house is reachable. Together the handle and the mob head are light weighted and is self-wringing, as it easily spins dry with a gentle push on the handle. So, no bending, wet hands or contact with dirty water. The mop head holds over 8000 strands of microfiber which absorbs 8 times its weight in liquid and is machine washable up to 300 times, then with this set there’s no need for expensive disposable pad refills, batteries, cleaning solutions or power and with twist and shout offering the added service of uploading user friendly profitable videos demonstrating key features that sets them apart including the offer of a lifetime warranty for Amazon customers, this home cleaning can be placed righty at the very top with the best. Similar to the O-cedar easy wring spin mop but with its own unique features, the hurricane spin mop home cleaning system is up there with the very best. Its an innovative 360-degree rotating microfiber mop, great for all types of floor that needed to be cleaned and polished. With each dip in the bucket, you get to mop with a clean dirt-free microfiber mop head as the system is designed to spin away dirty water from the mop head. Sponges and rope mop heads are so yesterday, making way for the all-round effective and efficient microfiber head. The hurricane spin mop microfiber mop head picks up 10 times its weight, with the excess water sucked up in the microfiber head rather than on your floor. With hurricane, cleaning can be easier and faster, as the mop and the mop heads fits into all places including under the furniture and in the very edges around the room corners. This is possible due to the special features of the mop; the mop has a 360-degree pivoting mop head that slides under the tightest of furniture gaps as it’s easy to maneuver considering its light weight, it weighs less than 2 pounds. Unlike a bucket with wringer, the hurricane system comes with a revolutionary wet mop bucket that uses centrifugal spinning technology to clean the mop head spinning away dirty water. To use this technology, dunk your mop in the bucket like you would normally do, placing the mop head in the circular basket, push down on the pedal with your foot and the basket spins. The faster you push your foot on the pedal, the faster the basket spins, but you must be careful not to spin too fast and remember the patented spinning bucket works exclusively with the hurricane spin mop. What’s the job at hand? You might have to ask yourself if the mop will be used only on ceramic tiles, how large is the room or place you want to clean, etc., so that you can look for effectiveness and efficiency in the equipment you purchase. What’s your budget for the mop? Buying a more expensive mob doesn’t necessarily translate into buying the better quality and vice versa, so you might want to examine how much you really want to spend on the mob and search out the best fit for the job at hand and the funds in the pocket. 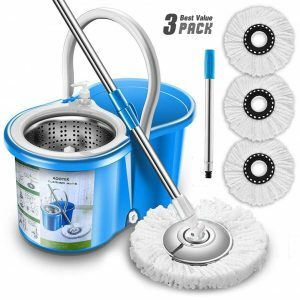 Our overall Best Mop For Ceramic Tile Floors is the O-cedar Easy Wring Microfiber Spin Mop, it’s a classy and classic set, with excellent features that makes it a perfect cleaning tool on any floor. It combines the best in value, efficiency, longevity and appearance. It’s a product that is incredibly easy to use, lightweight and compact. Mop is one item in the house that’s very well used, yet you don’t need more than one if you are a ceramic tile floor user and no matter how often you clean your house, having a good mop at your disposal is key as it comes handy when the kids, pets, etc. makes a mess of the floor.